Many of us recall Hans Christian Andersen's fairy tale about the princess sleeping on a stack of mattresses, who is able to discern a solitary pea at the bottom. In this re-imagining for readers and listeners up to 8, we experience the tale from ten points of view, including that of the overbearing queen, the spoiled prince, a mother mouse, and a street smart doorman. 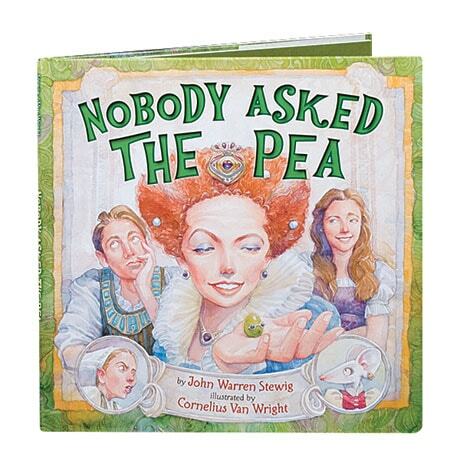 Princess Lucy is the young lady with the very sensitive back, who will make a better man out of the prince, and Patrick the pea is the proud legume who winds up as a museum exhibit. John Warren Stewig's short texts add novelistic depth to the tale, while Cornelius Van Wright's watercolor and pencil illustrations blend fine draftsmanship and expressive gestures.